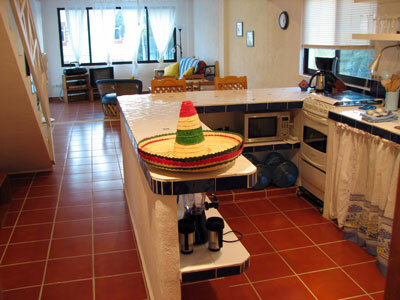 This vacation rental is a very bright and breezy apartment on the second floor of a private 4-plex with a wonderful terrace. 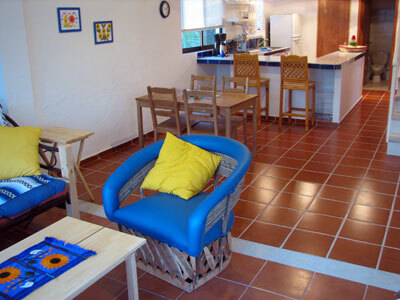 It is 1 queen bedroom/2 bathrooms with an open, low ceiling, sleeping loft. The loft and living room each has a double pull out sofa which sleeps two. Complete with a large, fully equipped kitchen including seating bar, full-size fridge, microwave, stove with oven, toaster, coffee maker, blender etc. Everything that you will need to make meals in your own home. This suite has its own private large shaded veranda complete with dining table and hammock. -Folding beach chairs, umbrella, masks &snorkels for a nominal fee.